Each Easter, we fly up to Northern Sweden, Norrland, where only approximately 12 percent of Sweden’s nearly 10 million inhabitants reside. My sambo (live in boyfriend) grew up in a small village here a stone’s throw from the Baltic Sea. Year round, it is the most breathtaking, picturesque part of the world I have ever seen. Even the quality of the air feels different. We arrived on Thursday and have since tasted some of the best local fish (bleak) grilled right over an open fire, walked and snowmobiled on the sea, and had the best homemade cookies (recipe to come) for our fika, the cherished coffee break in Sweden. We have also spotted a herd of reindeer (owned by the indigenous Sami in Sweden) that roam freely through Northern Sweden. Luleå is a city with a population of nearly 47,000. It is known for Luleå University of Technology, Luleå Hockey Club, and it’s steel production. It is part of Norrland, one of the three land regions in Sweden. They have a saying in Sweden, “det finns inget dåligt väder, bara dåliga kläder,” which literally translates to “there is no bad weather, only bad clothes.” In other words, there is no excuse to stay in when it is super cold or overcast. I still struggle with this from time to time, but I am a Florida girl. Swedes have evolved to make the best of any weather conditions. I was reluctant to head outside yesterday as it was a bit overcast and super cold. Today was another day. The sun was shining in every direction, the sky was blue. We decided to spend it the way most Swedes in the area spent the day, walking and snowmobiling on the frozen sea!!! We celebrated Easter together with Fredrik’s family in his sister’s family’s cabin. We ate grilled moose and reindeer from a bbq made in the snow. Many Swedes own a “summer house” which often consists of a large open room complete with a primitive kitchen, dining, and sleeping areas. 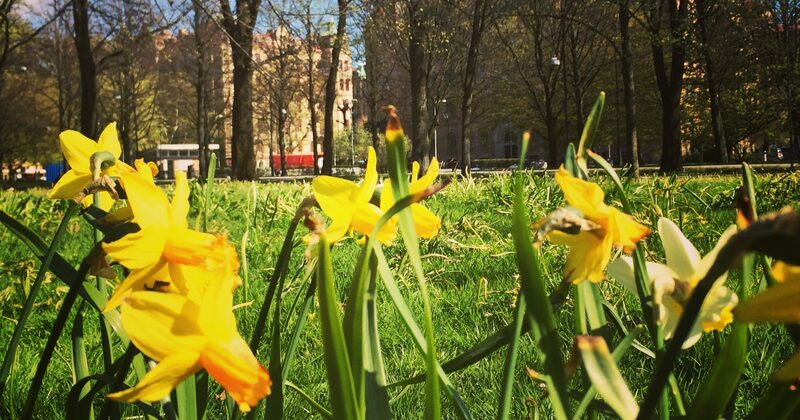 Spring and Easter usually mark the time when Swedes open up their cabins for use. Easter in Sweden is mostly secular. The Easter bunny is not as celebrated a tradition as back home. Instead, children (boys and girls alike) dress up as Easter witches and go from house to house wishing their neighbours a Happy Easter. In return, they are given candy (similar to trick or treating on Halloween). In addition, parents give their children Easter “eggs” that are filled with candy. Food traditionally served around Easter can vary, but generally consists of boiled eggs, cured and/or smoked salmon, cold cuts (ham, moose, and/or lamb), cheese, bread, potatoes, and pickled herring.